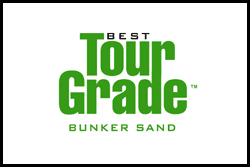 Best Tour Grade Bunker Sand (530 & 535) – TourGrade Bunker Sand is a quality bunker sand that offers firm ball support and consistency from one season to the next. TOUR GRADE meets your demands for quality, consistency and value by providing the look and standard of play you want, year after year, at a price that fits your budget. Weaver Golf offers two grades, Tour Grade 530 and 535 Bunker Sand. Best Tour Grade Signature Blend Bunker Sand - Manufactured to create a sub-angular sand that stays in place even on the steepest faced bunkers. Provides a high penetrometer reading for firm ball support and allows for excellent playability. Sub-angular grain shape conforms and adheres to bunker slopes. 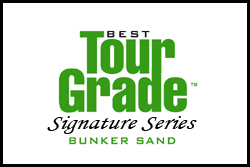 Best Tour Grade Signature Bunker Sand – Bunker Sand is produced by crushing larger silica stones and creating very angular sand. These angular grains will adhere to the steepest bunker faces, giving you the highest penetrometer reading for firm ball support and still allow for excellent playability.